Provide comfort for the family of Wanda McCrary with a meaningful gesture of sympathy. 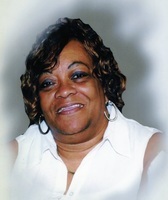 Mrs. Wanda Lee McCrary, 64, of 8 Baldwin Street, Greenville, South Carolina, passed away on Tuesday, March 19, 2019, at her home. She was the eldest child of the late Howard Black, Jr., and Doris McCullough-Black. She was a member and usher at Pilgrim Rest Baptist Church until her health began to fail. She attended Greenville County Schools and was a former employee of Subway Restaurant. She was preceded in death by her husband, Mr. Bennie Fred McCrary; and brother, Gerald Howard Black, III. She leaves to cherish fond and precious memories with her children, Venessa Black, Renita (Spencer) Black, and Elizabeth McCrary of the home, all of Greenville, SC, and Fredrick (Kizzie) McCrary of Simpsonville, SC. ; three sisters, Kathy (Lee) Hamilton, Dorothy Black and Jennifer Black, all of Greenville, SC; one brother, Donnie Black of Greenville, SC; a special cousin, Harmeter (John) Crockett; three aunts, Mollie Finley of Anderson, SC, Pollie (Rev. W.L.) Cowan of Belton, SC, and Johnnie Carter of Manhattan, NY; one uncle, Jimmy McCullough of Greenville, SC; seven grandchildren; four great-grandchildren; and a host of nieces, nephews and other relatives. I wish to express my deepest condolences to the family. Words alone cannot ease the pain when grieving the loss of a love one. The Bible provides comfort during these difficult times. Revelation 21:3-4 states, "And he(GOD) will wipe out every tear from their eyes, and death will be no more, neither will mourning nor outcry nor pain be anymore. The former things have passed away". May God give you comfort in your loving memories and in His promise that soon we will never experience losing our love ones we will be able to see them again once they are resurrected John 5:28-29. May these scriptures bring comfort and calmness of heart to you during the difficult days ahead. To learn more about this promise please visit our website: jw.org and view the comforting video; What is the Condition of the Dead? My condolence to the family. When we lose the ones we love we need comfort and the scripture offers comfort and a hope John 5:28,29 speaks of the resurrrection, Psalms 37:11speaks of a time when the earth will be a paradise. [" the meek will inherit the earth". Meditating on these words may also be of comfort to you. To the McCrary family I'm sorry about your lost, my hopes and prays are with your family.